In the Irish Free State, the land purchase annuities amounted to over £3m per annum, a substantial figure (given that the total revenue intake in the early 1930s was approximately £25m). The average burden of the annuities on the individual farmer was not huge—about 10% of net income—but it was a fixed amount, so the burden increased in difficult times. There had been proposals in the revolutionary period to withhold annuities as a protest strategy—such as during the conscription crisis of 1918, or to offset local government grants withheld by the British government. The consensus, however, was that such a move would damage the embryonic state’s credit rating and hamper ongoing land transfers. 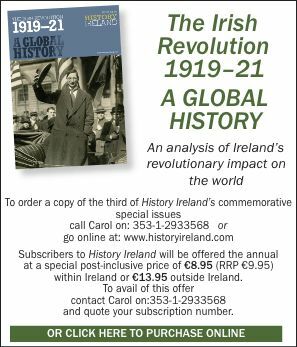 It was during a debate on this issue in 1923 that Minister for Home Affairs Kevin O’Higgins made his famous comment about their being ‘the most conservative-minded revolutionaries that ever put through a successful revolution’. The 1920 Government of Ireland Act allowed for the respective governments of Northern and Southern Ireland to retain the annuities; this obviously never came into force in the south, but remained the position in Northern Ireland. Under Article 5 of the 1921 Anglo-Irish Treaty, annuities were included as part of what the Irish Free State would pay to service the United Kingdom public debt. In 1923 the Free State government agreed to collect annuities from tenants and pay them into the British land purchase fund. The Boundary Agreement of December 1925 released the Free State from its Treaty obligations to service the UK public debt, but the paying over of annuities continued and in March 1926 the Cumann na nGaedheal government agreed officially with the British that the Irish state would continue to do so. Peadar O’Donnell (centre)—the crucial figure in the anti-annuities agitation—with the delegation of the recently formed Irish Working Farmers’ Committee (IWFC) at the Congress of Peasants International (Krestintern), Berlin, March 1930. The agitation spread and committees were organised across the country. Garda Commissioner Eoin O’Duffy—who would later support a non-payment campaign wearing a different hat (and a different shirt)—warned of the danger of a ‘red terror’ in the countryside arising from O’Donnell’s campaign, which elements in the IRA were supporting. The agitation pushed the issue onto the national agenda. During the June 1927 general election campaign Sinn Féin leader J.J. Kelly urged non-payment, while de Valera declared that his newly formed Fianna Fáil would not pay the annuities over to Britain if in power. The characteristic ambiguity (wherein he did not urge non-payment but hinted at retention of the annuities by the Irish state) was an indicator of the divergent views between himself and O’Donnell on the issue. Fianna Fáil, after it came to power in 1932, was warned by the Department of Finance about the danger of scrapping the annuities: abolition would create ‘that insecurity of title that would justify the appropriation of all land by the state . . . and the question of land distribution would certainly arise in a revolutionary form’—something O’Donnell and the Left craved but which Fianna Fáil would never countenance. Colonel Maurice Moore, a senator who had joined Fianna Fáil, had been speaking out in the Senate about the immorality and illegality of the land annuities and produced a pamphlet, British plunder and Irish blunder. He joined forces with O’Donnell to launch the Anti-Tribute League in early 1928, a key aim being to force Fianna Fáil to embrace the issue. Many of its TDs and councillors came on board, taking effective leadership of the campaign while eschewing its more overtly illegal aspects and the whiff of cordite surrounding it and many of its activists. The campaign focused on county councils, and by the end of 1928 Clare, Galway, Kerry and Leitrim councils had passed resolutions against payment, while the Fianna Fáil árd fheis had come out against the annuities. De Valera’s party was now at the forefront of the opposition. Its position was based on straightforward moral and pragmatic financial arguments from the Moore thesis, bolstered by the opinions of eight legal experts employed to analyse the issue. The arguments were as follows. 1. British landlords had no moral right to the land of Ireland in the first place. In de Valera’s words, the lands to which the annuities related were ‘rewards given in the past to military adventurers from England . . . the British government has found it desirable to convert those land rewards into money, and it was manifestly unfair to ask the citizens of the Irish Free State, from whom the land had been taken, to pay compensation to the persons who had deprived them of it’. 2. The retained monies would be of major benefit to the Irish economy and would fund measures such as agricultural de-rating and land redistribution. 3. The British had no legal right to the annuities, which were a contingent liability for the Irish share of the UK public debt under the Treaty; the removal of this debt obligation under the 1925 Boundary Agreement also removed the annuities payment obligation. In addition, the 1923 and 1926 agreements between the Free State and British governments had not been ratified by the Dáil and thus were not binding. So the payment of £3m a year was a free gift to the British. According to Cumann na nGaedheal and the British government, the bulk of the annuities was not part of the UK public debt. Lands purchased under the 1891–1909 acts had been financed by the issue of stock; Irish purchasers repaid these stockholders, and even though the state provided the machinery of collection, payment and guarantee it was not the direct beneficiary. They also maintained that the 1923 and 1926 agreements were binding as it was never specified that they were subject to ratification. With the Great Depression of 1929, the numbers of defaulters rose rapidly. There was also a general radicalisation in Irish politics and a strengthening of the developing republican–communist nexus. O’Donnell was a crucial figure in this and in 1930 helped to form an Irish Working Farmers’ Committee (IWFC) as a branch of Krestintern, the communist Peasant International. The IWFC became a central plank of the IRA’s socialist platform, Saor Éire, formed in 1931. Saor Éire, the IWFC, the IRA and a plethora of other left-wing and republican groups were banned in 1931 amidst a flurry of church condemnation, red scare-mongering and state repression. An unintended beneficiary of the red scare and repression was Fianna Fáil, which swept to power in March 1932. The new Fianna Fáil government withheld the general annuities payment, due on 1 July, and retained it in the Irish exchequer. The British responded swiftly with a tax on Irish imports designed to recoup the amount, which in turn provoked Irish tariffs on British imports, and thus began the Economic War. The British offered to put the annuities issue to an arbitration tribunal but insisted that it be made up of British Commonwealth representatives, to which de Valera would not agree. British records show that the cabinet was unsure of its ground and feared that ‘a certain arbitrator might hold that Mr de Valera is right from a purely legal and technical view’. In Ireland, in the meantime, the amount collected was about to be drastically reduced, through government concessions, which saw the annuities payments reduced by 50%, and a new anti-annuities agitation, spearheaded this time from the right rather than the left. Large cattle-farmers (‘the ranchers’ or graziers, the 8% of farmers who owned 50% of the land and who had benefited most from Cumann na nGaedheal’s policies) were hardest hit by the trade war. Part of their response was a campaign of resistance to the payment of annuities, led initially by the National Farmers and Ratepayers Association (Centre Party), which became a constituent part of the new Fine Gael party established in September 1933, along with Cumann na nGaedheal and the fascistic Blueshirts. The latter, led by former Garda Commissioner Eoin O’Duffy, began to reorient themselves as an agrarian protest organisation, mobilising to resist seizures and auctioning of cattle, and attacking those charged with collecting annuities. 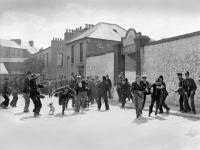 Subsequent clashes with the Gardaí included the fatal shooting of Michael Lynch in Marsh’s cattle yard in Cork in August 1934. O’Duffy pushed for an annuities and rent strike, but Fine Gael baulked at the idea of advocating illegal action and the radicals lost the initiative; this, combined with the deployment of special Garda units to counter the agitators and the easing of the Economic War from 1935, contributed to the demise of the campaign. In early 1938, de Valera and his officials opened negotiations with London to end the Economic War. De Valera told his British counterparts that ‘if a solution could be found on the basis of making a certain payment, it would have to be made clear that such a payment did not include anything in respect of the land annuity claim’. The British eventually accepted this, and agreed that the Irish would make a one-off £10m payment in respect of the remaining annuities and other payments (amounting in total to approximately £100m). Prime Minister Neville Chamberlain told Dev that he could go home and ‘make a great deal of the fact that the United Kingdom government had agreed to wipe out the Land Annuity payments’. This he did, and the 1938 Anglo-Irish Agreement, which included the return of the ‘Treaty ports’ as well as the resolution of the annuities dispute, was presented, quite plausibly, as a triumph by Fianna Fáil. The settlement represented a ‘victory’ on the annuities, despite the trade war’s negative impact on Ireland’s exports and broader economic fortunes, though this has often been exaggerated. It could be argued that it vindicated de Valera’s bold decision to default—certainly with regard to Fianna Fáil’s political fortunes, if not Ireland’s economic ones. The annuities issue had been a flexible political weapon, wielded at various times by the far left, far right and militant republicans. Ultimately, it was Fianna Fáil that wielded it most successfully, symbolising its broader success over its political opponents on the left and right in these turbulent years of economic depression and political radicalism. HI Donal Ó Drisceoil lectures in the School of History, University College Cork. Further reading: M. Kennedy et al. (eds), Documents on Irish Foreign Policy, Volumes IV and V: 1932–39 (Dublin, 2004 and 2006). D. MacMahon, Republicans and imperialists: Anglo-Irish relations in the 1930s (London and New Haven, 1984). P. O’Donnell, There will be another day (Dublin, 1963). D. Ó Drisceoil, Peadar O’Donnell (Cork, 2001).